A yummy sweet originating in Turkey, soft pink in colour and so appropriate for a wedding. Made from a combination of sugar, gelatine, rosewater and other ingredients, this jelly-like confectionery is usually cut into cubes and most commonly rolled in icing sugar. Nuts such as pistachios or walnuts , or other flavours such as cinnamon or mint can be added. Pile them high on cake stands on your dessert table or use them as part of a sweet buffet along with similar coloured treats. Instead of a large communal sweets table, set up mini feasting offerings on each table incorporating different flavours of Turkish Delight. Used plain or perhaps dipped in chocolate they would make delicious favours. 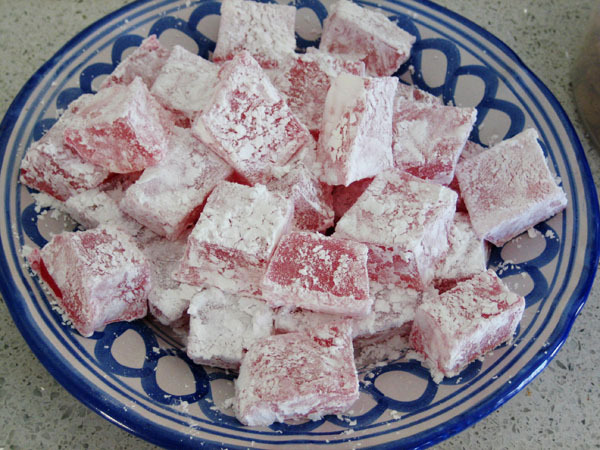 So (Turkish) Delight your guests and offer this most different of sweets! Yum! Turkish Delight is one of my favourites! !